Ringling Bros. World's Greatest Shows. Madam Ada Castello. Daring Madam Castello's amazing exploits on the equine marvel "Jupiter." The image is printed in its full aspect ratio on high quality smooth fine art heavy weight paper. PLEASE FEEL FREE TO ASK QUESTIONS. THANKS. Fabulous ! Love it ! 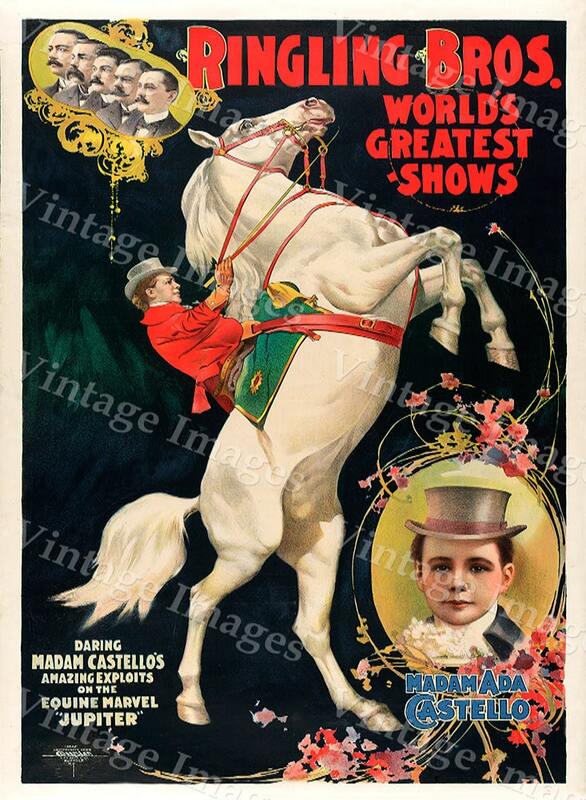 Perfect to add to my Circus poster collection......a very nice litho. Thanks so much for the goreat packing and timely shipping. Great purchase! Arrived right on time. The quality is outstanding!!!! Just as stated in the post. Couldn't be happier. Once payments have cleared (if its an eCheck and requires a clearance period) the items ordered will ship usually 24-48 hours. International customers are responsible for all or any duty charges their countries may incur. We currently use the USPS and ship via Priority Mail (2-3day) domestic. Express Mail service available on request. All of our images are placed against a thick piece of backing board, wrapped in tissue and placed in sturdy custom mailer. Prints are rolled safely and placed in a tube. We ship all orders within 48 hours. Domestic (US) orders usually arrive within 5-7 business days. International orders can take up to 2-3 weeks depending on customs. Custom orders are made on demand and will take longer. Yes. You will receive a shipping notification and tracking number as soon as your order ships. The notification is sent to your paypal or etsy address. WHAT HAPPENS IF MY PRINTS ARE LOST OR DAMAGED? If you think your order is lost in the mail, first check the tracking details. If the package is in transit, the tracking information should indicate an expected delivery date. If the tracking information indicates the package has delivered but you have not received it, contact us so we can assess the situation further. If your print arrives damaged, snap a photograph, email it to us, and we’d be happy to replace it. MAY I HAVE A REFUND? We are happy to provide a full refund or exchange for goods in their original condition provided you contact us within 15 days or purchasing. ARE YOUR IMAGES AVAILABLE IN DIFFERENT SIZES? MAY I ORDER AN EXTRA LARGE PRINT OR CUSTOM SIZE? Yes. If you don't see what you'd like in our custom section, contact us by clicking the contact button under the "shop owner" section on the left-hand side of our shop page.